Dr. Rose Magno is a graduate of LVI Las Vegas Institute for Advanced Dental Studies. Graduating from LVI signifies a commitment to continuing education at the highest postgraduate level in cosmetic, restorative, and neuromuscular dental education. What is an optimal bite? The optimal bite is the position of the jaw (in relation to the skull) that the surrounding muscles are most relaxed with. It is the goal of the neuromuscular dentist to find this optimal bite, using equipment that provides nerve-mediated muscle relaxation and computerized feedback from the muscles. The doctor can then use the optimal bite to make a removable orthotic for pain therapy or establish the position to rebuild the bite with porcelain restorations or orthodontic movement. The optimal bite position can also be used to make a Pure Power Mouthguard (PPM) for a non-symptomatic patient to enhance flexibility and athletic performance. How can headaches and migraines be related to a bad bite? A majority of pain experienced in the head and neck region comes from the muscles. Muscles produce pain when they are not comfortable within the position they are forced to function. The pain comes from a buildup of lactic acid in the fatigued muscle or tension that the overworked muscle is placing on another structure. When the system is overloaded with too much tension from the muscle, and sometimes enhanced with certain stimuli, the migraine occurs. The Las Vegas Institute for Advanced Dental Studies (LVI) is the premiere post-doctoral training center for advanced diagnostic, occlusal, and aesthetic dentistry in the world. The scope of available courses has spread to the spectrum of all areas in clinical dentistry as well as practice management. Only the top 1% of dentists in the country have had extensive training at LVI. Dr. Magno is one of these dentists. Dr. Magno has not only completed continuing education at LVI, she is also an instructor. Dr. Magno has done post-graduate dental training at LVI, indicating she has enormously expanded her knowledge and experience as a cosmetic and a neuromuscular dentist. By gaining all of this additional knowledge, she can offer you far more than just general dentistry. Dr. Magno can provide superior solutions to your smile imperfections. From porcelain veneers and tooth whitening, to an entire smile makeover, Dr. Magno has the knowledge and skill to change your smile. The way that your upper and lower teeth come together (your bite or occlusion) is part of a system of teeth, muscles and joints. If your teeth do not fit together properly (misaligned bite), the muscles and joints have to work hard to get them together. A misaligned bite often leads to muscles that are overworked when they should be relaxed, leading to various painful conditions. 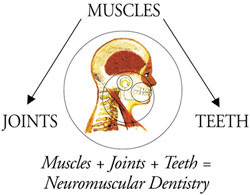 Neuromuscular dentistry considers the entire system that controls the positioning and function of your jaw. The neuromuscular dentist seeks to establish a physiologic jaw position based on a harmonious relationship of the three main factors affecting occlusion – the teeth, muscles and jaw joints. The resulting jaw position is called the neuromuscular bite. Continue reading below to learn more or visit our page dedicated to TMD and Headaches or see our other articles. TMJ, temporomandibular joint disorder, also called TMD, occurs when the function of your bite is out of harmony. The muscles, teeth, and bones aren’t working together properly, which can lead to clicking, popping, or discomfort in the jaw. It can also cause damage or wear on your teeth. But because the muscles of your jaw work with those in your neck and head, the effects can go beyond your mouth, including headaches, ringing in the ears, neck pain, even numbness or tingling in your fingers. A Neuromuscular Dentist is trained in identifying and treating TMJ Dysfunction and can provide relief for those symptoms your medical doctor and other dentists may not be aware of and therefore would not be able to treat. Most people don’t think to mention the pain in their facial muscles or jaw joints to their dentists. Yet such pain is a common symptom of TMD (Temporomandibular Dysfuntion) or otherwise known as TMJ. This condition causes pain on both sides of the forehead and sometimes in the neck as well. Other symptoms of TMD may include jaw pain, biting or chewing difficulty or discomfort, reduced ability to open or close the mouth and popping/clicking of the jaw joints during opening and closing. Following are a few of the more common symptoms that may possibly be associated with your TMD. If you have one or more of them, you should visit a dentist with special neuromuscular training in the field of TMD. Getting treated by a Neuromuscular Dentist can remove or reduce the symptoms above. Neuromuscular dentistry is more than just treating TMJ, it’s an entirely different way of looking at dentistry that can improve the appearance, comfort, and durability of your dental restorations. For example, if you crack a tooth, your traditional dentist may want to just put a dental crown on it, but a neuromuscular dentist will ask “why did that tooth crack?” and identify the bite imbalance that will crack the dental crown the way it did the tooth. This is especially important when using porcelain veneers to restore worn, chipped, or cracked front teeth. Under normal conditions, porcelain veneers are highly durable and will last for decades, but a bad bite will destroy them. A neuromuscular dentist will also look at the impact a dental restoration may have on your current bite, and won’t give you a crown or filling that will cause you long-term discomfort or poor fit. One of the things that neuromuscular dentists pride themselves on is the enormous amount of data and research that they have accumulated over the years proving the efficacy of neuromuscular non-surgical therapies in the resolution of TMD and TMD associated ailments.